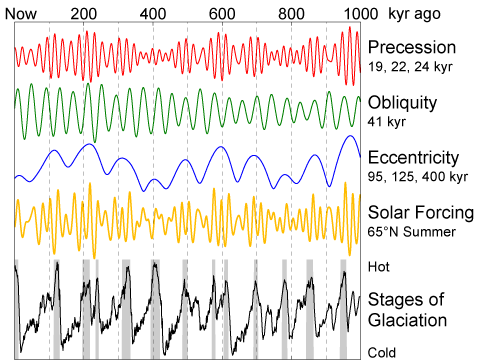 Paleoclimatology: How Can We Infer Past Climates? Created by Monica Bruckner, Montana State University. Scientists take samples from the center of the coral. Clipperton Atoll, 10°N, 109°W. Photo by Maris Kazmers (courtesy of th NOAA Image Gallery). 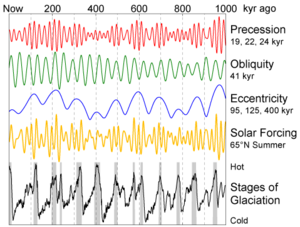 Paleoclimatology is the study of past climates. Since it is not possible to go back in time to see what climates were like, scientists use imprints created during past climate, known as proxies, to interpret paleoclimate. Organisms, such as diatoms, forams, and coral serve as useful climate proxies. Other proxies include ice cores, tree rings, and sediment cores (which include diatoms, foraminifera, microbiota, pollen, and charcoal within the sediment and the sediment itself). Past climate can be reconstructed using a combination of different types of proxy records. These records can then be integrated with observations of Earth's modern climate and placed into a computer model to infer past as well as predict future climate. How Are Organisms Used As Proxies? Foraminifera, such as this Globigerinoides species, can be used as a climate proxy (copyright O. R. Anderson, accessed from the Micro Scope website (http://starcentral.mbl.edu/microscope/portal.php?pagetitle=assetfactsheet&imageid=962). Foraminifera, also known as forams, and diatoms are commonly used climate proxies. 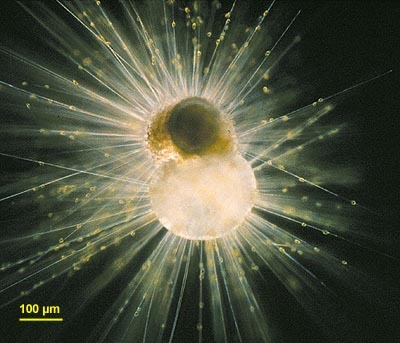 Forams and diatoms are shelled organisms found in aquatic and marine environments. There are both planktonic, or floating in the water column, and benthic, or bottom dwelling, forms. Foram shells are made up of calcium carbonate (CaCO3) while diatom shells are composed of silicon dioxide (SiO2). These organisms record evidence for past environmental conditions in their shells. Remains of foram and diatom shells can be found by taking sediment cores from lakes and oceans, since their shells get buried and preserved in sediment as they die. The chemical make up of these shells reflect water chemistry at the time of shell formation. Stable oxygen isotope ratios contained in the shell can be used to infer past water temperatures. These oxygen isotopes are found naturally in both the atmosphere and dissolved in water. Warmer water tends to evaporate off more of the lighter isotopes, so shells grown in warmer waters will be enriched in the heavier isotope. Measurements of stable isotopes of planktonic and benthic foram and diatom shells have been taken from hundreds of deep-sea cores around the world to map past surface and bottom water temperatures. Researchers may also use foram and diatom population dynamics to infer past climate. Relative abundance as well as species composition in particular areas may indicate environmental conditions. Typically, warmer weather will cause organisms to proliferate. In addition, since each species has a particular set of ideal growing conditions, species composition at a particular site at a particular time may indicate past environmental conditions. How Are Other Proxies Used? 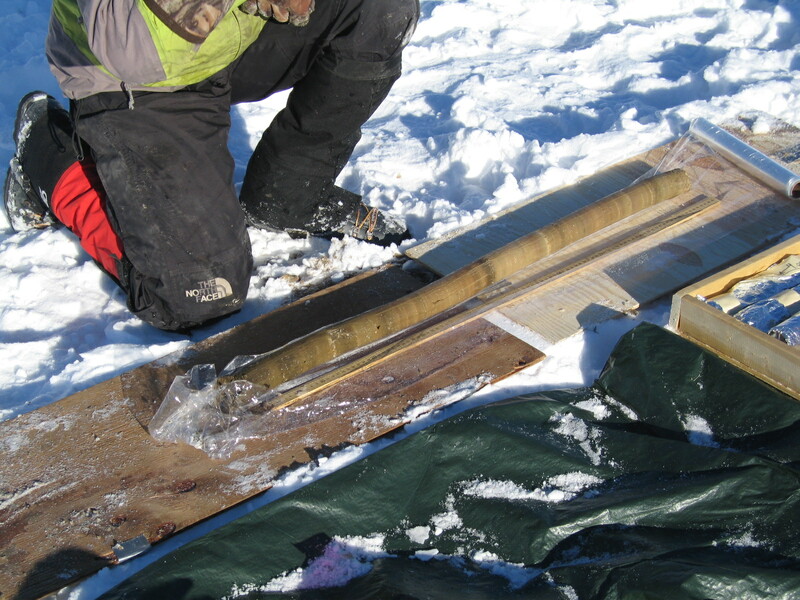 Scientists extrude an ice core from its barrel with the utmost care. Photo by Kendrick Taylor, Desert Research Institute, University and Community College System of Nevada (image courtesy of the NOAA Image Gallery). 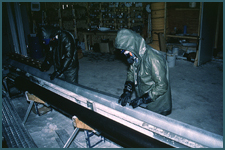 Ice core records- deep ice cores, such as those from Lake Vostok, Antarctica, the Greenland Ice Sheet Project, and North Greenland Ice Sheet Project can be analyzed for trapped gas, stable isotope ratios, and pollen trapped within the layers to infer past climate. Individual events such as forest fires are recorded in tree-rings. 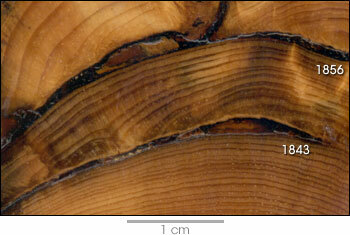 The dark arcs that interrupt the sequence of rings in this sample were caused by fires in the 19th century. (Photograph copyright Henri D. Grissino-Mayer and accessed via the NASA Earth Observatory website). Tree rings- can be counted to determine age. The thickness of each ring can be used to infer fluctuations in temperature and precipitation, since optimal conditions for the particular species will result in more growth, and thus thicker rings for a given year. Scars and burn marks can indicate past natural events such as fire. 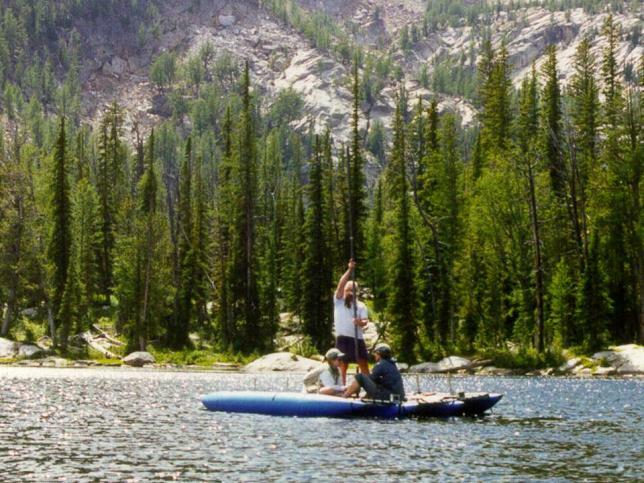 A sediment core drilled from Blacktail Pond, Yellowstone National Park. Photo courtesy of the Montana State University Paleoecology Lab. Sediment cores- can be analyzed in many ways. Sediment laminations, or layers, can indicate sedimentation rate through time. Charcoal trapped in sediments can indicate past fire events. Remains of organisms such as diatoms, foraminifera, microbiota, and pollen within sediment can indicate changes in past climate, since each species has a limited range of habitable conditions. When these organisms and pollen sink to the bottom of a lake or ocean, they can become buried within the sediment. Thus, climate change can be inferred by species composition within the sediment. Changes in atmospheric content of greenhouse gases. The Milankovich theory accounts for climate change due to long term changes in Earth's orbit. Image courtesy of Robert A. Rohde / Global Warming Art (http://www.globalwarmingart.com/wiki/Image:Milankovitch_Variations.png)]. The Milankovich Theory states that variations in Earth's orbit causes climate to change through time. According to this theory, changes in the shape of Earth's orbit around the sun (eccentricity), variations in Earth's axial tilt (obliquity), and the tendency for Earth to 'wobble' with respect to the direction of its rotational axis (precession) affect climate. This wobble can lead to fluctuations in the amount and distribution of incoming solar radiation, resulting in dramatic changes in climate over long time scales. Wobble may cause ice ages. Modern period- Hundreds of years. Time scale affects interpretations of climate change. Climate has both long term trends and short term variability. In looking at longer time scales, major shifts in climate such as the ice ages are easily recognizable, and viewing a long-term data set can provide the observer with a sense of the "big picture" of the climatic trends. Short term variations, like a colder than average month, can exist within longer term patterns such as the warming trend over the past 1000 years. The coexistence of short and long term trends occuring simultaneously through time complicates our ability to unravel climate change. 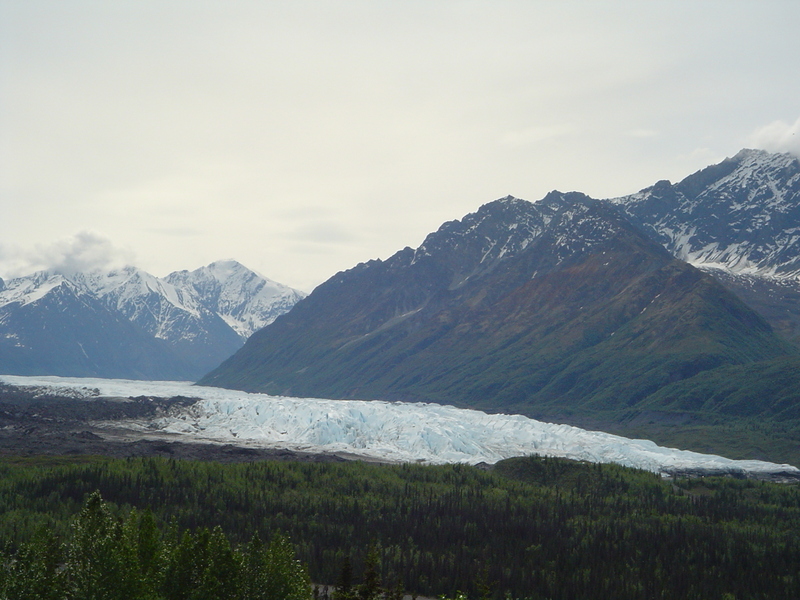 The science of paleoclimatology is important for past, contemporary, and future issues. Understanding past climate helps us to explain how current ecosystems came to be. For example, climate typically controls what types of vegetation grow in a particular area. Furthermore, paleoclimatology provides data that we can use to model and predict both current and future climate change scenarios. Computer models can be used to study the potential effect of increased atmospheric carbon dioxide on climate. With a system as complex as Earth's climate, it is a daunting task for scientists to be able to make projections about future climate changes and how it may affect the distribution of plants and animals. However, paleoclimate data are used as a foundation for climate scientists by providing crucial information such as rates of past climate change and how vegetation and animal populations responded to the change. Computer models can be used predict different future climate patterns, and paleoclimate data provides a useful framework from which to base these models. For more information about climate proxies and climate change, see the collections of web-based materials below. Photo by Eric Edlund, courtesy of Cathy Whitlock. General Collection Resources such as news articles, web sites, and reference pages provide a comprehensive array of information about paleoclimate and climate proxies. Advanced Collection: Compiled for professionals and advanced learners, this climate proxy/paleoclimate collection includes resources such as journal articles, academic reviews, and surveys. For Educators: This climate proxy/paleoclimate collection includes activities, assignments, and reading materials created specifically for educators. For additional resources about climate proxies and related topics search the Microbial Life collection.